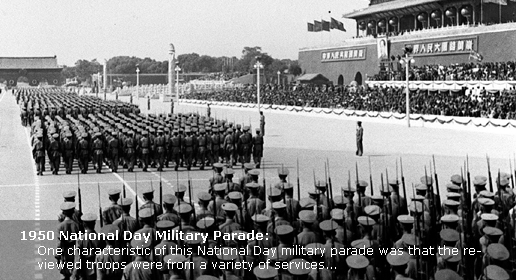 Seventy-three-year-old Li Min remembers the day in 1949 when she experienced the first National Day parade from the central leadership compound of Zhongnanhai, on the western side of Tian'anmen Square. From her Chang'an Avenue vantage point, she clearly heard the jubilant crowds roar their excitement. "Long live the People's Republic of China, Long live Chairman Mao!" the then 13-year-old said, remembering the thousands of excited people expressing their happiness, optimism and respect for her father - Mao Zedong - who proclaimed the founding of New China from the Tian'anmen Rostrum. "My father had supper with us in Zhongnanhai that evening. He looked very tired but quite happy," Li recalled during a special gathering 60 years later. On Sept 27, days before the 60th anniversary celebration, more than 200 people - the children of former leaders and generals who helped found New China - gathered in Wanshou Hotel in west Beijing. Hugs, salutes, smiles, greetings and the joy of reunion filled the hall. The sons, daughters and relatives of those early leaders signed their names on eight Red Army flags to mark the nation's Oct 1 birthday. Zhai Yunying, 83, the widow of Liu Yalou (1910-65), the first air force commander for the People's Republic of China, was among them. Despite the fact that she now relies on a walking stick, she bent down to sign her name on the flags. Chen Xiaolu, son of Marshal Chen Yi (1900-72), one of the nation's founding fathers and China's foreign minister between 1958 and 1972, also attended, along with his wife, Su Huining, daughter of general Su Yu (1907-84). "The country is getting stronger and richer. We wish that our fathers could see it in heaven," said Chen. "This country experienced so many ups and downs in the past 60 years. I feel happy today," Li Min added. During the gathering, 92-year-old former Red Army solider Pu Wenqing and 94-year-old Zhu Zhongli, wife of Wang Jiaxiang (1906-74), one of the earliest members of the Communist Party of China and ambassador to the Soviet Union in 1949, sang revolutionary songs. "I still have passion and energy to serve the country. Let's celebrate our motherland's birthday together," Zhu said before starting to sing. "In 10 years time, many of us probably will not be able to meet together to celebrate the 70th anniversary," said Xu Wenhui, 70, who organized and funded the event. "So, we cherish every minute today." Xu's father, Xu Haidong (1900-70), was nominated as one of the 10 senior generals of the founding of New China. Xu Haidong led the 25th Division of the Red Army successfully finished the Long March and was wounded several times during many battles. His valor on the battlefield earned him the nickname "Tiger Xu" and led to him being named as one of the Kuomintang's three most wanted people, together with Mao Zedong and Zhu De. Xu Wenhui was born in 1939 in a cave-house in Yan'an in Shaanxi, where the Red Army was headquartered. Four months later, her father's troops transferred to Anhui province, the frontline during the War of Resistance against Japanese Aggression (1937-45). "My father taught me to be a righteous person and help those in need," said Xu, who became a doctor. Qu Duyi, 87, sat quietly at the table, smiling at her old friends, especially those who had worked with her in Moscow. 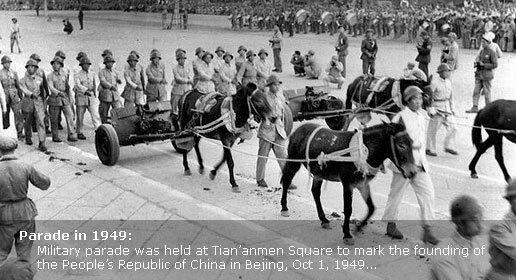 On Oct 1, 1949, Qu accompanied delegates from the Soviet Union as they stood on the Tian'anmen Rostrum to witness the historic moment. She went on to become the first person to broadcast the news about the founding of New China in Russian, worldwide. Qu is the daughter of Qu Qiubai (1899-1935), one of the first leaders of the Communist Party of China. She and her husband went to Moscow and established a branch of the Xinhua News Agency there. "Although the Soviet Union was the only country to officially acknowledge New China then, we knew the country would get stronger," she said. Li Tete, 85, was full of thoughts of her father at the party. "It feels great to meet so many friends today," she said with a smile, remembering Li Fuchun (1900-75), who was vice-premier of New China in charge of the country's economy and heavy industry. "He read documents and books at night and got up early every day for his first meeting. He cared about nothing but reestablishing industry from the ruins," Li said. Li became a nuclear researcher and participated in China's first explosion of an atomic bomb in 1964. 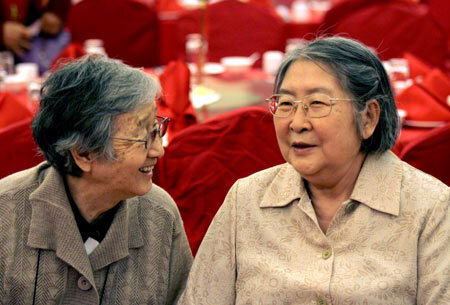 Zuo Taibei, 69, could remember little of her father, Zuo Quan, deputy chief of staff for the Eight Route Army. He died in combat in 1942 during the War of Resistance Against Japanese Aggression in Shanxi province. Zuo was 2 years old at the time. Zuo Quan was the highest ranked military leader to die in the conflict. Zuo knows about her father, in part, from the 11 family letters he wrote during the war. "How is our daughter now? I really want to hold her in my armsI miss you," he wrote in one of his letters to his wife three days before he paid the ultimate sacrifice. "Today, we can look back on that time while enjoying the peace and happiness of our lives together. That's what my father and those millions of soldiers sacrificed their lives for," Zuo said.